Italian physician, theologian, and cabalist; flourished in the first half of the sixteenth century. He had a religious controversy with Fra Francisco da Acquapendente, in which he bitterly attacked Christianity for its dogma of original sin, for its claim of salvation exclusively for its own adherents, and for its hatred of Judaism, the religion which furnished it with the kernel of its teaching, and which, in contrast with the Church, attributes a share in the future world to the righteous of all nations. This disputation he described in a Hebrew pamphlet entitled "Wikkuaḥ," existing in manuscript (Cod. Munich, No. 312, and Cod. Vienna, No. 16). He wrote also under the title "Iggeret Ḥamudoṭ." (Neubauer, "Cat. Bodl. Hebr. MSS." No. 1927; Cod. Munich, No. 112; et al.) a strong apology of cabalistic doctrines, which, although not printed, became well known in the sixteenth century. In this pamphlet he attacked the religious philosophers in an undignified and offensive manner, especially Isaac Abravanel, the author of "'Aṭeret Zeḳenim"; and he was one of the first to spread the fable that Maimonides had retracted his anti-Talmudic and anti-cabalistic sentences (Leon de Modena, "Ari Nohem," pp. 4, 33, 35, 70; Ibn Yaḥya, "Shalshelet ha-Ḳabbalah," p. 60). 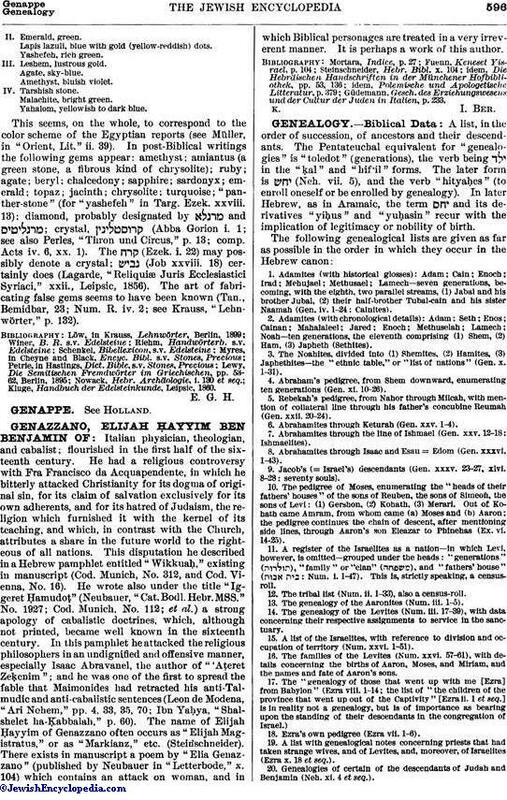 The name of Elijah Ḥayyim of Genazzano often occurs as "Elijah Magistratus," or as "Markianz," etc. (Steinschneider). There exists in manuscript a poem by "Elia Genazzano" (published by Neubauer in "Letterbode," x. 104) which contains an attack on woman, and in which Biblical personages are treated in a very irreverent manner. It is perhaps a work of this author. Güdemann, Gesch. des Erziehungswesens und der Cuttur der Juden in Italien, p. 233.